A couple of days before the arrival of spring we stopped at Amnicon Falls to check on ice conditions. The ice was still around but was breaking up. As we walked around the trails every once in a while the ground would shake and we would hear a loud bang. At first we thought it was someone dynamiting but it turned out that the river was washing away at the ice on the surface and every once in a while a large chunk would collapse causing the vibration and sound. We are starting to see some signs of spring. 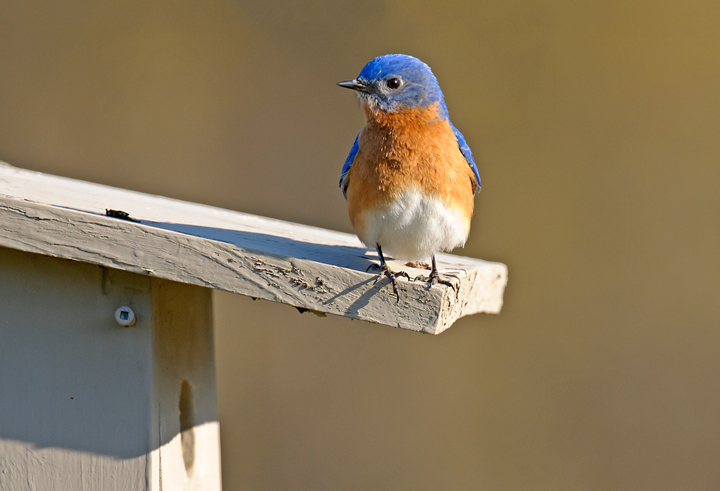 We Saw our first Eastern Bluebird yesterday sitting on one of our bird houses. 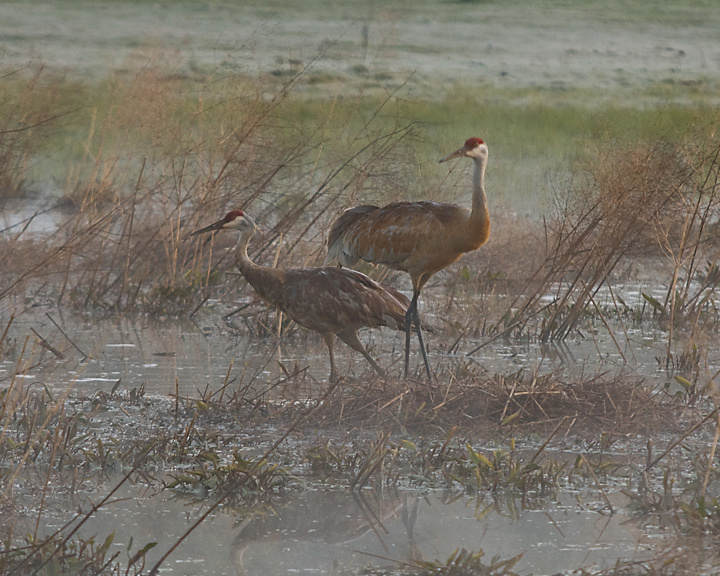 A couple of Sandhill Cranes were in a local nature area. On Monday morning the Mesabi Miner was scheduled to be the first ship to leave Duluth/Superior to start the shipping season on Lake Superior. I watched all morning but there was no activity. Around noon the scheduled changed and the John G. Munson was now scheduled to leave around 3pm. My wife noticed that the Munson had pulled away from the CN Dock in West Duluth where it had loaded Taconite. We jumped in the car and drove down to Canal Park to watch it Leave the Harbor. We were early and waited in the warm car while the Munson made its way down the harbor. In the mean time a small crowd of photographers had gathered to watch the first ship of the season leave the harbor. Typically when a ship sails under the Duluth Lift Bridge it blows its horn in a “long-short-short” sequence. It is a friendly salute to the Port of Duluth from the ship captain and is responded to by the lift bridge operator with the same sequence. As the Munson sailed under the bridge there was a long sequence of horns and cheers from the crew as the opened the shipping season. As soon as the Munson was free of the ice surrounding the harbor entrance it must have accelerated because it started belching black smoke. In contrast to last year the Munson arrived at the Soo Locks by Thursday. On Sunday morning my wife and I were heading out for a walk along the Duluth waterfront when I check the Marine Traffic on my phone and noticed that the Heritage Marine Tug the Nels J was out breaking ice. We decided to forgo the walk and drive out to Rice’s Point to watch the tug work. When we arrived the tug was working at the Calumet Fuel Dock which is a secure area where we couldn’t photograph. I assumed that a ship was going to move from winter layup to refuel before the start of the shipping season and the Nels J was breaking up ice around the dock. I was having problems following the Nels J with my Marine Tracker and discovered the app hadn’t been updated in some time so I updated it. When It came back on I noticed the Nels J was heading to Rice’s Point. I grabbed my camera but was a little late to get any good photos. Just about then my wife noticed another Heritage Marine tug, the Helen H sail out from Howard’s Pocket where the Frasier Shipyards are located. We watched as the Helen H moved back into Howard’s Pocket. We jumped in the car and drove down to Conner’s Point which offers a good view of the ships in winter layup at Frasier Shipyards. Sure enough the Helen H had already broken ice to free the John G. Munson from the ice. As was getting up steam to move out of winter layup. This was a far cry from last year when we watched most of the day while the Helen H and Nels J tried to free the Munson from the heavy ice. Duluth has a good collection of Boat Nerds that show up whenever there are boats moving. Many of the folks that were watching the Munson leave were also on hand to watch the Indiana Harbor arrive to end the shipping season at Wisconsin Point. We watched as the John G. Munson slowly backed out of Howard’s Pocket and under the Blatnick Bridge. It was followed by the Helen H in case it ran into trouble. He Nels J was waiting at out in the Saint Louis River in case it was needed to help turn the Munson. The Munson then sailed under the Blatnick Bridge past Rice’s Point before turning and then backing into the Calumet Fuel Dock where it spent several hours refueling. The Nels J was on hand in case it needed help docking. On the last day of the race we spent the morning skiing. We arrived at the race well ahead of the time the first finishers were scheduled to arrive but the course conditions were very good and two teams had already arrived when we reached the course. It started to snow just as we arrived. Some of the mushers arrived in a group. Here three teams were neck and neck. the second team passed the first team just before the finish line. We walked around and watched to dogs get fed. This dog was really hungry and finished his foot and tried to get the food of another dog but he was constrained by the harness. As this team arrived another team was getting fed and they tried to stop and eat the food from the team that had already been fed. On Day two of the CopperDog 150 Sled Dog Race we drove up to Eagle Harbor to watch the start of the race. The mushers start in reverse order, that is the leading musher is the last to start. We walked around quite a bit watching the racers leave the starting area. We also spent time watching the teams being hooked up as well as being brought to the starting line. It was a little different this year because someone had packed the snow down in the park so it was much easier for the mushers and volunteers to hook up the dogs and get them to the starting line. Every year the kids get bored with the race and usually start playing in the snow. this little girl was building a snowman. We had gone skiing and were a little late arriving and most of the dogs had been fed and put back in their houses until the start of the race. The race officials were checking the bags and the mushers were starting to get their sleds hooked up. At the start of the race some dogs are a little more excited than others. We watched the first tier of dogs start off and then walked around and watched the volunteers bring the sleds to the start line. We stopped briefly at Bond Falls on our way up to Calumet for the CopperDog 150 Sled Dog Races. It was a beautiful sunny day and a little difficult to get photos. There was almost too much ice on this visit. I photographed these birds about a month ago. It turned out to be the last snowfall of the season, unless we get an early spring snowfall. This was the last time I saw any House Sparrows. They had been around in large numbers most of the winter but I was gone for a week and when I returned they were gone. This was one of the rare times this winter that I was able to photograph female Northern Cardinals. There were several of them around during the snowstorm.